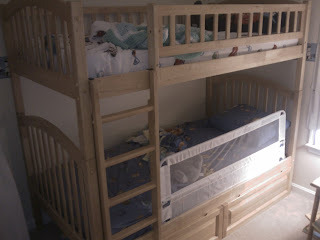 My father-in-law (aka Bob the Builder) put together the kids' new bunk beds while I was at work yesterday. He did a great job and everything was ready to go by the time I came home. Lori put on all the bedding items and the kids were ready to experiment co-habitation in the same room last night. I was out losing money at the monthly poker game, but when I got home Lori and her Dad told me that the kids kept coming out of their room more than usual before finally getting to sleep around 9-something. Then around 6 AM this morning, Alex strolled on out of his bed (he's sleeping on the bottom for safety reasons) and started crying for Mom. He now gets to experience the freedom he once had when he figured out how to climb out of his crib (before we thwarted that tactic with a crib tent). We managed to get them to sleep a little longer but they were up and rowdy in their room again well before the standard wake-up time of 7 AM. It looks like we'll be going through a tough transition phase to get them to "behave" in the morning. Better to get it out of the way now before Daughter arrives. We plan on tying the lure of the Wii and television as incentives for being "good" in the morning. I believe the next item on the agenda is painting Daughter's room (formally Josh's room). I'm very fortunate/grateful to have such a handy father-in-law on hand to help out with these projects at home. It looks like there is no room for him to "stroll" out of the bottom bunk. He's a magician.